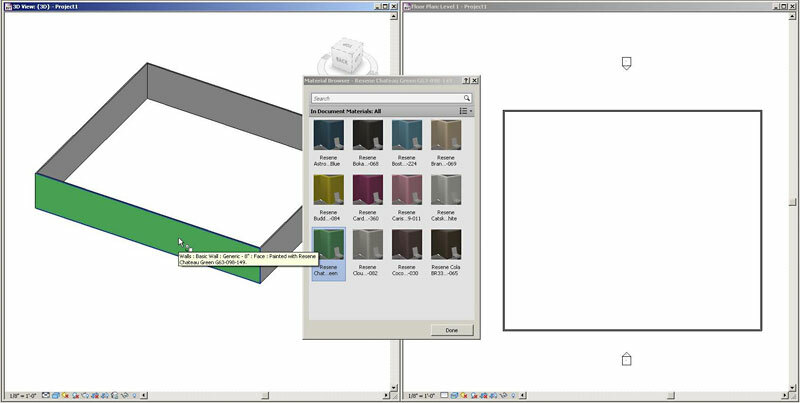 The Resene BIM paint colour files for Revit Architecture 2013 allow you to quickly and easily use Resene’s vast paint colour range in your Revit projects. You can quickly test different colour schemes and provide your clients with more realistic visualisations.. These colour files require Revit Architecture 2013 or higher. 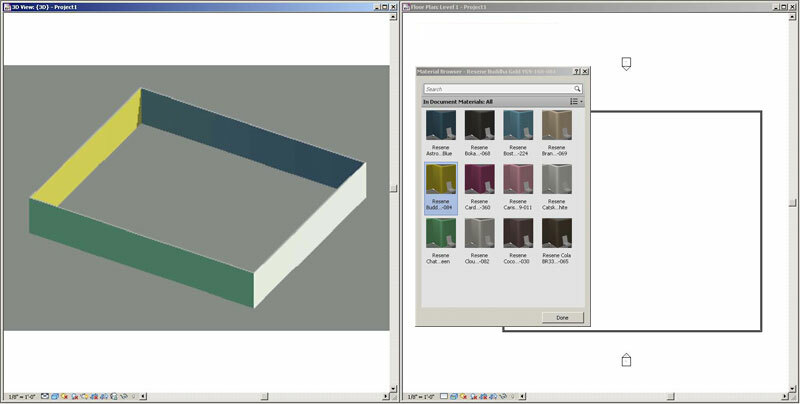 All of the colours have been made into Revit material libraries and have also been optimised for use with the Revit rendering engine. 1. 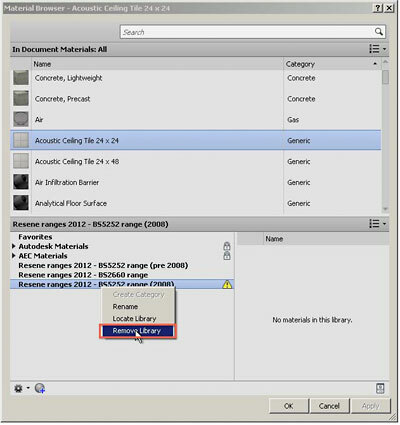 Open the Material Browser from the Manage Materials tab. 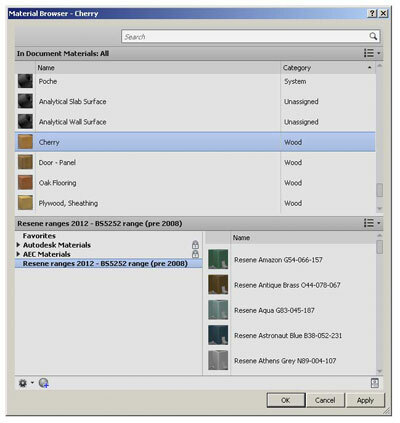 Select “Open Existing Library” and select the Resene paint colour library file you would like to load into your project and press “Open”. 2. Select the colour you would like to add to your document by pressing the “Up arrow” button for each colour. 3. 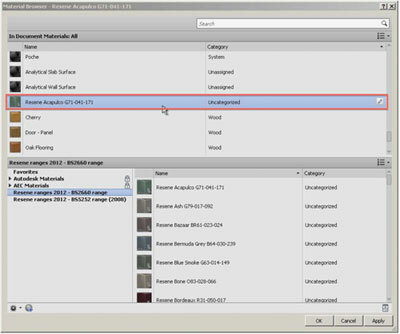 This adds the colours to your document material list allowing you to apply them to your model. 4. 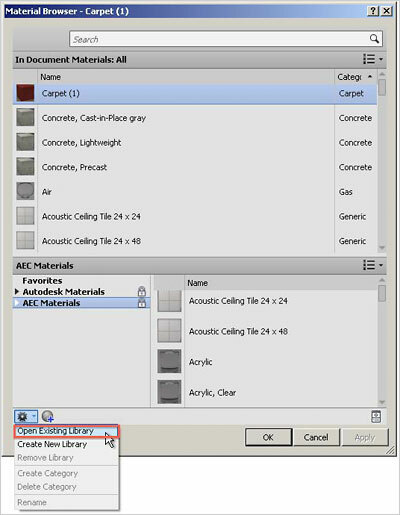 Troubleshooting tips The new library might not be able to load into your project if there are existing materials with the same name. Try to remove the others in the library before re-loading new ones into the project..
5. After removing the others from the library, you will be able to add new ones. 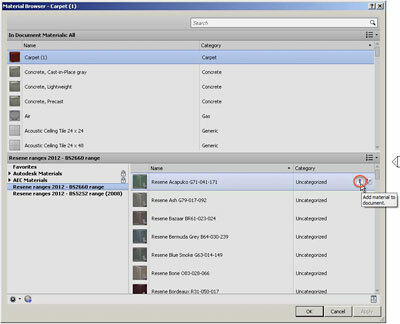 You can add more paint colours at anytime, by simply going back to your Material Browser. The Resene paint colours you have added can now easily be applied to walls, slabs, roofs, models etc. throughout your project. Example steps to apply Resene materials to walls 1. 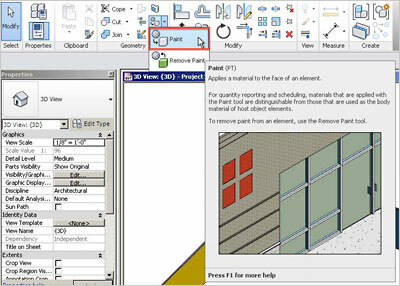 Create walls in your project and select Paint tools from Modify Geometry tab. 2. 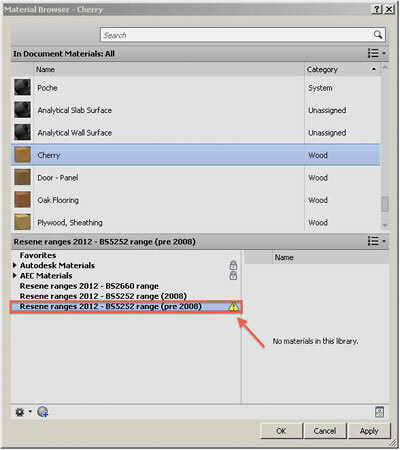 The document materials browser will appear and you can select the material and apply it to the model. Mac: To download the file you wish to use, please use the Right mouse or hold down "Control" and click on the file name, choose "Save link as", choose a destination folder, select "All files" in the 'Save as' field of the dialogue box and click "Save".